How much is Peter Forsberg Worth? Peter Forsberg Net Worth: Peter Forsberg is a Swedish retired professional hockey player who has a net worth of $54 million. 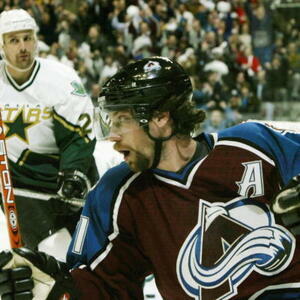 Peter Forsberg was born in Ornskoldsvik, Sweden in July 1973. He played for Modo Hockey Jr. in the Swedish Junior Hockey League and for Modo Hockey in the Swedish Hockey League. He was drafted #6 by the Philadelphia Flyers in the 1991 NHL Draft. During his 13 year NHL career Forsberg played for the Quebec Nordiques, Colorado Avalanche, Philadelphia Flyers, and Nashville Predators. He won two Stanley Cups with the Avalanche in 1996 and 2001. In 1995 he won the Calder Memorial Trophy and was part of the NHL All-Rookie Team. Forsberg was selected to the NHL First All-Star Team in 1998, 1999, and 2003. In 2003 he also won the Art Ross Trophy, Bud Light Plus/Minus Award, and Hart Memorial Trophy. He played in the NHL All-Star Game in 1996, 1997, 1998, 1999, 2000, 2001, and 2003. Forsberg represented Sweden in international competition and won Gold at the 1992 World Championships, 1994 Olympic Games, and 2006 Olympic Games. As of 2014 he was eighty in all-time career points-per-game and fifth all-time in career assists-per-game. Forsberg was inducted into the IIHL Hall of Fame in 2013 and the Hockey Hall of Fame in 2014.